The day Snapchat brought in the bed was a weird day in the office. Next came the hangers in the closet with clothes on them and the pictures of random people on the walls. Before long, it looked like it Snapchat had set up an apartment inside the office, a former employee told Business Insider. “It was like an IKEA set up, but nobody really slept there,” the ex-Snapchatter said. Adding a bed wasn’t just a new office perk. For the last 18 months, Snapchat has been inspected by the city of Los Angeles for its use of the Thornton Lofts apartment spaces, which the company uses as offices. The beds were hauled in ahead of an inspection by city officials, the former employee claims, to give the impression that someone was living there when really it was just more office space for Snapchat’s growing staff to sprawl into. A Snapchat spokesperson said the company was in compliance with regulations, but declined to comment further on the matter or provide information about who lives in the units. Yet, some of the neighbours were suspicious. According to case records obtained by Business Insider through a public records request, Snapchat’s office at 619 S Ocean Front Walk came under inspection by the LA Department of Building and Safety starting in March 2015 after somebody complained it was being converted into another use. The second complaint was more direct and included the other office space it had been renting: “The 10 residential units in the combined projects at 619 and 701 Ocean Front Walk are being used by Snapchat Inc., primarily for office and not residential uses,” alleged the complaint. Parking spaces that were supposed to be available to the community were also removed, according to the complaint. The friction with the neighbours and the unusual office arrangement provide a revealing window into the rapid growth at Snapchat, which has become one of the most popular apps among teens, even as its operations have remained closely guarded by the company’s penchant for secrecy and its Los Angeles home base, hundreds of miles away from most of its internet rivals. When an inspector toured the property in May, escorted by a lawyer, he noted a kitchen, shower, and a “bedroom with a bed and closet with clothing.” Alongside it were “several docking stations for computers used for commercial services.” Another case management form notes that one condo included at least eight desks set up. The condo units appear to be zoned as “live-work” spaces, which means that Snapchat would be allowed to use the apartments for work. But the units must also have a resident, and it’s unclear who is “living” in the Snapchat office. 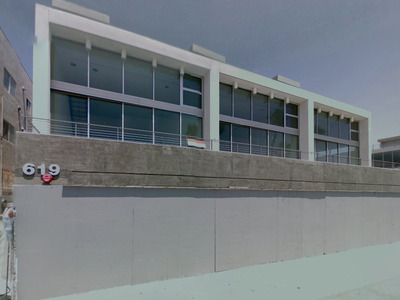 Google MapsThe lofts at 619 S Ocean Front Walk have doubled as Snapchat offices. The furniture was added to make it look like someone was living there in compliance, according to the ex-Snapchatter, but no one ever did. Instead, the perk of working in one of these vacation-condo style apartments meant that Snapchat employees would hit the beach and then shower off in the bathroom. For people working late or on odd shifts, there was a bed to nap on. The employees worked around the fake photos on the walls and ignored the hangers in the closets. On June 15, the inspector closed the case for the LA Department of Building and Safety and referred it to the Los Angeles Housing Department. Based in Venice, the $18 billion company has struggled to build its real estate empire to match the pace of its growth. Snapchat built its campus by expanding into small office buildings throughout the eclectic neighbourhood, instead of planting its roots in a corporate office park, as its rivals up in Silicon Valley have. That sprawl though has presented its challenges, as shown by the inspections spurred by worried neighbours. Its expansion hasn’t slowed, though, and the company recently signed a contract to expand out of Venice by taking up space at the Santa Monica airport.